A Silent Voice is a film that, I think, should be mandatory for middle schoolers to watch. You know how all middle schoolers have to see certain films like Dead Poets Society or Remember the Titans or Rudy? Movies that impart good morals without stepping over the line of content that one can safely play them without a permission slip? All over the nation on days near impending Winter or Summer breaks, or days when teachers are hung-over, or for any number of other excuses, teachers will put on a movie for the kids, and it’s usually something safe like Despicable Me or a Marvel film. The useless movies need to be swapped out for proper, moral-teaching movies. Last year Wonder entered the Middle School Movie Pantheon, and it’s good, definitely, but it isn’t A Silent Voice good. Students, particularly at that awkward, horrible age where bullying is most rampant, most brutal, and most effective, need a movie like this. A Silent Voice tells the story of a high schooler named Shoya, who is planning to kill himself after he squares his debts. He works and saves up money to give to his mother, for example. And the last thing on his list is to somehow make things right with a girl named Shoko who briefly attended middle school with him. Back then, you see, he was a bully. Not a bully with a rough home life or deep emotional issues. He was just a kid, acting out because he didn’t know any better, against people who were different from him. Shoko was the most different person he had met to that point. She was deaf. And despite her persistent efforts to make friends with him and the other classmates around her, Shoya made her life as difficult and as painful as possible, ring-leading lesser acts of bullying by his own example. One day, however, Shoko stops showing up. She has moved away because of all the bullying. And it is at this point that all of Shoya’s friends forget whatever parts they played, and begin to ostracize Shoya for his role as Bully In Chief. He spends the intervening years between that time and the present of the film in isolation and self-loathing. A Silent Voice is an exploration of self-love and forgiveness, both in who deserves to give and to receive it. It looks, with wide-open eyes, at how cruel we can be to ourselves and to those around us, and it wounds the audience, but always in service of leading us back to the message that we can do and be better. It is the sort of purely ideological story that I only see coming out of Japan. For how different they are from Americans in their outward displays of emotion in personal interactions, the Japanese regularly best us Westerners at emotional story-telling because the messages conveyed in their media are usually without compromise. Though deep questions are asked, the answers are usually very simple. In this case, the answer, “love yourself, love others, acknowledge you are not perfect, but do not hate yourself for it,” is pure, concentrated goodness and I think we need to hear that sort of thing more often than we do. I loved this film, and can’t wait to watch it again. It releases on home video on 2 April 2019, but the 2016 film and its English dub are out in the wild if you know where to find them. I suggest, one way or the other, that you see it. One more note of interest: although the anime industry’s dubbing wing, both in Japan and abroad in the West, primarily use the same handful of actors for everything, they did the right thing this time for both the Japanese and English dubs and hired actual deaf women to play Shoko, and at least for me, it added to my ugly crying throughout the film as she struggled to be understood. It is Good: four out of five stars. 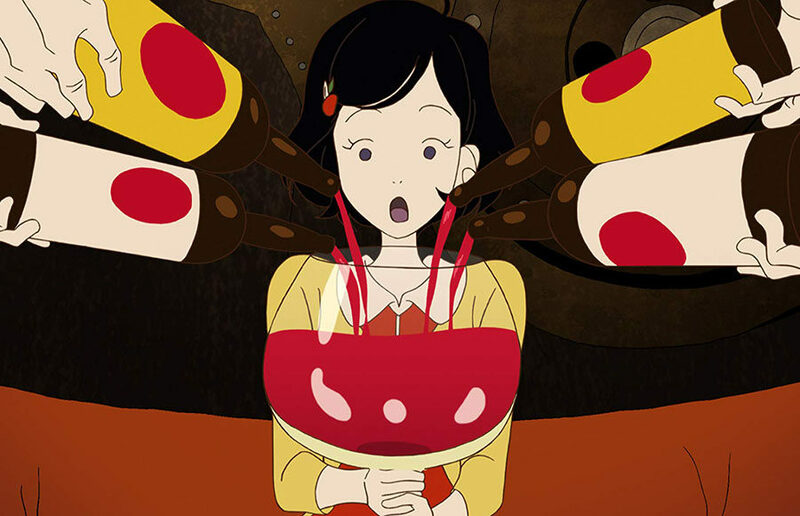 The second film I wanted to talk about is Masaaki Yuasa’s Night is Short, Walk On Girl which is also an adaptation of a book by the same name by Tomihiko Morimi. Night is Short, released in America with the article The out in front, and while I missed it during its limited theatrical event back in August, I didn’t forget to keep my eye out for its eventual disc release, which occurred this week. I put off watching it, hoping this friend or that might join me, but when none did I finally threw it on last night to enjoy with myself, and I thought the world of it. A quick note of complaint, though: there is no English dub on the disc. I know purists love their subs, but this movie is an animated feast for the eyes, and it disappointed me to have to keep reading the subtitles all the while when what I wanted to be doing was looking at the movie. This movie was at all times charming, gorgeous, hilarious, and was never, ever boring. Its run time flies by and one is left with a lovely, warm feeling at the end. Its abstractions have a sort of non-sense, surrealist feeling, but it never strays far from its simple, grounded story about its protagonist and the man who fancies her. Masaaki Yuasa creates the sort of anime that one can hold up and easily declare to be high art in the faces of all those people who scoff at anime’s value. In its silliest moments, it does give way to a few tired tropes about perversion, but I find them easily enough overlooked in their scarcity. If you love anime, or even animation in general, this film is unmissable. It isn’t as deep as A Silent Voice, but then, it isn’t trying to be. And just because it is a lighthearted affair doesn’t mean it is less valuable than films which are trying to tug at your heartstrings or teach you philosophical lessons. I’m calling Night is Short, Walk On Girl Good as well, and also giving it 4 stars out of 5.